Have you heard of Boston brown bread? Sadly, it's a slowly fading American tradition rarely found outside of New England today. Thanks to its shape, it's also known as coffee tin bread. Traditionally, folks made it in tall, skinny canisters — and later on, in tin coffee cans. Boston brown bread is soft, moist, and dense. Baking soda historically serves as its leavening agent and molasses lends it a dark hue. It's made from the same whole grains — wheat, rye, and corn — that were so abundant during the early American colonies through the late 19th century. Real ovens were a luxury back then, therefore brown bread was steamed in a pot of water over an open fire, yielding its heavy, moist texture. Personally, I love Boston brown bread with goat cheese. In New England, it's still popular served with baked beans, franks, and clam bakes. I can attest that it is delicious with butter, cream cheese, or any sweet jams. However you enjoy it, know that you're eating real, nourishing, unprocessed food! Boston brown bread -- a slowly fading American tradition -- is soft, moist, and dense. I personally love it spread with goat cheese! Makes 1 loaf. Whisk buttermilk, milk, and sourdough starter together. Add molasses and butter, whisking well to combine. Stir in flours and salt. Cover, then leave at room temperature for 8 to 12 hours, or overnight. When ready to bake, add 4 cups water and trivet (with handles up) to insert pot of pressure cooker. Butter sides of baking dish (I use this souffle dish), or line with parchment paper. Transfer dough into baking dish, then carefully lower dish into cooker. Then put on the lid of your cooker, checking that the seals and all components are in good shape, including being in the sealing position. If using an electric cooker, such as an Instant Pot, set to high for 50 minutes. Or if using a stove-top cooker, bring to high pressure and maintain pressure for a cook time of 50 minutes. Once cycle is complete, quick release pressure. Remove baking dish by holding trivet handles. Finally, let bread cool completely in dish before removing and serving. Enjoy! Since it's important to retain moisture when baking Boston brown bread, pressure cooking is just perfect! Instead of taking 3+ hours to bake, it's done in about an hour. In my version, I tossed the ingredients with sourdough starter instead of baking soda. However, if you wind up over-fermenting the dough until it's too sour, feel free to add some baking soda to reduce the sourness. I changed the traditional loaf shape for the sake of convenience, but you can use any vessel that fits in your pressure cooker. I used this 2-quart porcelain souffle dish. Have you ever heard of Boston brown bread? Will you try it? Valeria lives in Chicago with her three kids and beer-brewing husband. 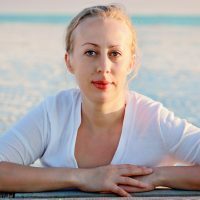 Born and raised in Russia, she incorporates her Siberian heritage into everyday cooking for her family. She loves baking with ancient grains and all things naturally leavened. There's hardly anything she hasn’t tried fermenting. She works full-time as a medical device rep but always finds time for her two passions: photography and cooking. You can find her at Beets and Bones. 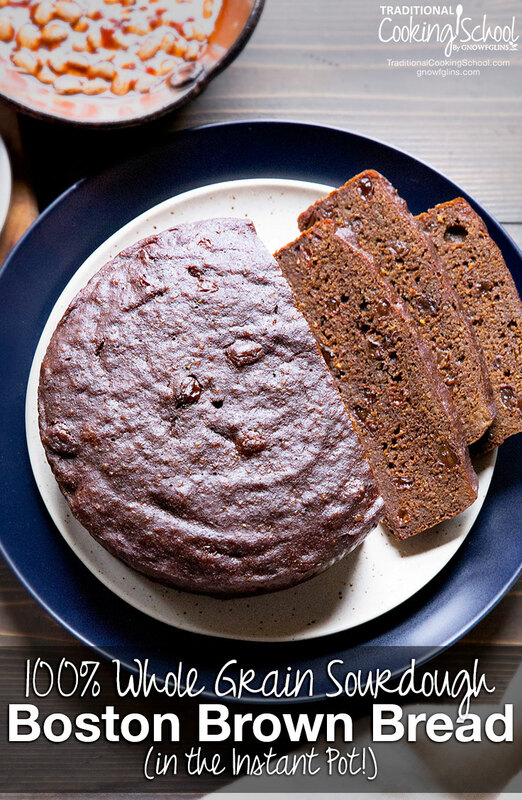 Your Whole Grain Boston Brown Bread sounds wonderful and I would love to try it, but I have never used a pressure cooker and don’t have any interest in adding one to my kitchen. Is it possible to adjust this recipe to another method–gas oven or electric slow cooker? Thank you. If you use the yeast instead of the sourdough starter, do you still let it sit out for 8-12 hours? For the purpose of leavening only, 1-2 hours is probably enough, or until you get a good rise. If you want to make sure your grains are nicely soaked to release their full potential and also softened, letting it sit for 8+ hours is a good idea. My grandma used to make this in the wide mouthed pint and a half Mason Jars. Now she would “can” it, although it isn’t recommended now for storage. I did think I would make some in jars, though, just for a pretty gift. Hmmm . . . . .now here are IP directions ! I wonder if you can put the Mason Jars in the IP ? 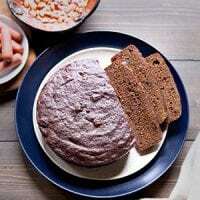 When I was growing up, we always used to eat Boston Brown Bread with baked beans. It was my favorite bread. Then, as an adult, I had a recipe to bake it in a can sitting in water in a Crock Pot, but I lost it. I don’t have an IP, and do not intend to buy one any time soon, but I think I will try this recipe in the slow cooker. I already have all of the ingredients and some empty cans and other dishes that would fit, so what is there to lose? This sounds wonderful can I actually use a coffee can in the pressure cooker to cook the bread. Yes. I am also wondering. Can we use the cans ? Also. . . .is it safe to use a Mason canning jar in them ? I don’t have an Instant Pot yet. If I steam it on the stove in a regular pot with water in wide mouth pint size jars, how long will it take? Can I actually can it I water bath canned? My grandma used to can it like that BUT it is NOT recommended by the Ball people that you actually can it like that. Something about the center may not get “cooked enough” to kill bacteria ? I was thinking though about just cooking it in the jars and then putting on a lid and pretty ribbon and giving it as a gift. Of course, it would have to be used soon and refrigerated and and you would have to let people know that. . . However . . . . . . IF YOU LOOK on the Cultures for Health website, you will find a similar recipe (with yeast though) and the cooking directions for steaming it in a pan on the stove. I would post a link but not sure it is allowed ? At any rate . .. . you should be able to find it if you look. The Cultures for Health recipe also called for a 2 quart dish, but it told me the internal temperature should be 195-200. So at least I knew how to tell when it was done. I used 3 wide mouth pints and it took 2 hours to steam on the stove. We love your einkorn bagels and yummy dark breads ! So glad to see you here at GNOWFGLINS ! Almost every other Brown Bread recipe calls for the cans or other containers to be covered. I notice that your instructions do NOT say to cover the pan of dough with foil inside the Instant Pot. Is this correct? I have made the Fannie Farmer recipe many times in my slow cooker – looking forward to trying your yeasted version. delicious food.. nice recipe..Thank you for sharing this recipe..